Even though I rarely get sick, I brought in the New Year with an annoying cough. I took it as a sign that the time was right to try a recipe that Yuan had sent us several months previously: Perilla Seed Congee (a congee is a rice porridge). Yuan says this recipe is good for cough, asthma, and “weak Spleen,” according to traditional Chinese medicine. She adds that perilla seeds contain alpha-linolenic acid (ALA), an essential omega-3 fatty acid, which may protect against heart disease. Perilla leaves and perilla stems are also used as herbs in traditional Chinese medicine. In terms of traditional Chinese medicine, perilla seeds, which are considered pungent and warm, enter the Large Intestine and Lung to redirect the qi downward to treat coughing and wheezing, often when the patient has copious phlegm. I persuaded Warren to go to the herb store with me to buy perilla seeds. At first the shopkeepers didn’t understand his (usually pretty good) attempts at Chinese (in fact, I think they might have been Vietnamese), but then he wrote out the pinyin of the herb “zi su zi” and we were presented with 12 grams of the tiny seeds for 30 cents. I did an Internet search and found that perilla seeds are part of Korean cuisine (being sold as a powder in many Korean groceries). One blogger advised roasting the seeds for 5 to 10 minutes before using them. I tried dry frying them for 4 minutes, and they were decidedly burnt. We trekked back to a different herb store, where we procured more seeds. While we got the tiny seeds in both of our purchases, we ran across one comment online that there are a number of different types of perilla seeds, and that they vary widely in size and color. With the new seeds in hand, I cooked the congee several times, experimenting with roasting/not roasting and grinding/not grinding the seeds. I recommend roasting—but only for 60 seconds if you are using seeds as small as ours—and grinding (they grind easily and improve the consistency of the congee). Because I had some cold symptoms along with my cough, I added green onions (which also balanced the flavor of the perilla seeds nicely) and about a ½-inch piece of fresh, grated ginger, both commonly used to treat a type of common cold in East Asia. (Common colds that fall into this category, known as Wind-Cold, include chills, body aches, headache, and a cough). Here is my version of the recipe, which I must say really hit the spot in my bleary and hacking state. It makes 2 servings. Heat a dry frying pan over medium high heat. Add the perilla seeds and roast for about 60 seconds, shaking the pan the whole time. Be careful not to burn the seeds. The seeds are done when a nutty fragrance is released and the seeds are crunchy but not burnt. Immediately pour the seeds out of the pan and let them cool for at least a minute. Put the seeds in a spice mill or coffee grinder and whir until powdery (for us, this took 5 to 10 seconds). Add the ground perilla seeds, rice, and water to a small- to medium-size pot. Cover and bring to a boil. Lower the heat to achieve a simmer and leave the lid slightly ajar to let a little bit of the steam escape. Stir occasionally to push the seeds that clump onto the sides of the pot back into the mixture and to make sure the rice is not sticking to the bottom of the pan. 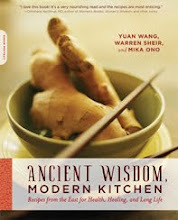 Cook for 40 to 60 minutes or until the rice is soft and your congee is the desired consistency. 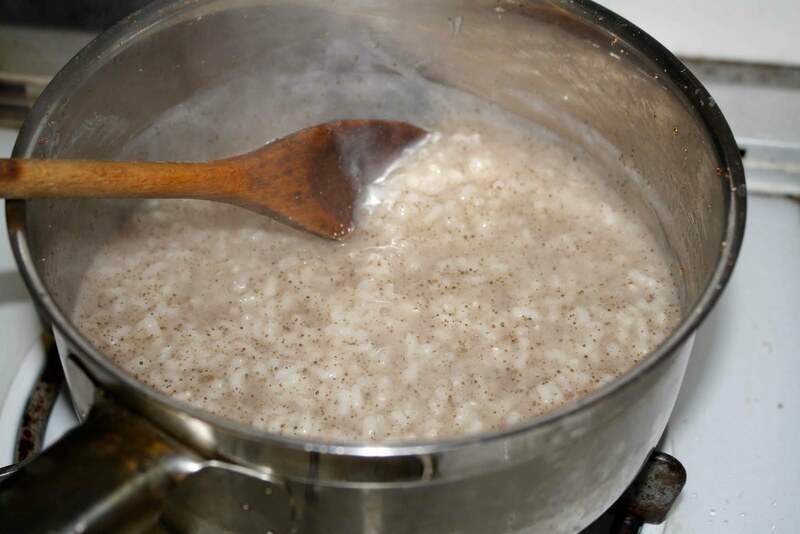 Add more water if your congee is drying out; if there is too much water, remove the lid to boil off some of the water. 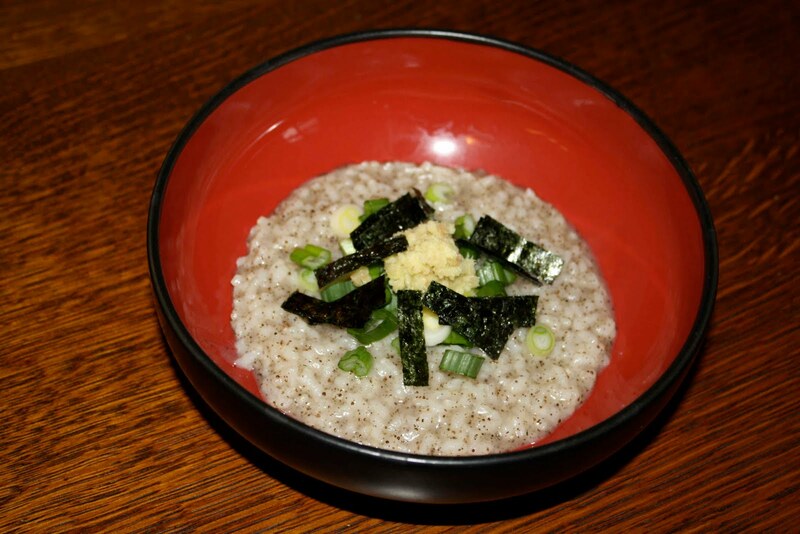 Spoon the congee into serving bowls and garnish with the green onions and any other condiments you desire. Add soy sauce to taste. Different varieties of rice will require different cooking times and different amounts of water. If you prefer brown rice, for example, use 1/6 cup of rice and about 2 ¾ cups of water then cook for 1 ¾ to 2 hours. So, did it cure your cough?